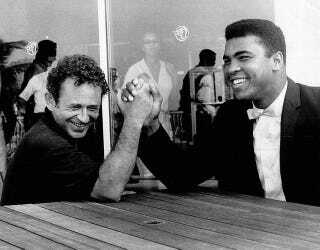 Norman Mailer went out running with Muhammad Ali one morning, a few days before the fight with George Foreman in Zaire. He asked me to go with him, but I thought of the long ride to Ali’s training camp at N’Sele in the darkness, and thumping along for five miles or so in the wake of the challenger, and, besides, I had done that sort of thing before with Joe Frazier. So I begged off. I said I didn’t have any equipment to run in. We came in very late from the gambling casinos in Kinshasa—around three in the morning—and Mailer was just coming through the lobby on his way out to his car. He had sneakers on, and long athletic socks rolled up over the legs of what was probably a track suit but of a woolly texture that made it look more like a union suit, so that as he came through the lobby Norman gave the appearance of a hotel guest forced to evacuate his room in his underwear because of fire: the impression was heightened by the fact that he was carrying a toilet kit. That night he and I had dinner and he told me what had happened. He had kept up with Ali for a couple of miles into the country upriver from the compound at N’Sele, but then he had begun to tire, and finally he stopped, his chest heaving, and he watched Ali disappear into the night with his sparring partners. In the east, over the hills, the African night was beginning to give way to the first streaks of dawn, but it was still very dark. Suddenly, and seemingly so close that it made him start, came the reverberating roar of a lion, an unmistakable coughing, grunting sound that seemed to come from all sides—just as one had read it did in Hemingway or Ruark—and Norman turned and set out for the distant lights of N’Sele at a hasty clip. He told me he had been instantly provided with a substantial “second wind” and he found himself moving along much quicker than during his outbound trip. He reached N’Sele safely, jogging by the dark compounds, exhilarated not only by his escape but by the irresistible thought of how highly dramatic it would have been if he hadn’t made it. I asked him what he was talking about, and he grinned shyly and began to admit that once he had got to the sanctuary of the compound he had been quite taken by the fancy of being finished off right there by the lion…all in all not a bad way to go, certainly a dramatic death right up there with the more memorable of the litterateurs’—Saint-Exupéry’s or Shelley’s or Rupert Brooke’s—and the thought crossed his mind what an enviable last line for the biographical notes in the big dun-colored high-school anthologies: that Norman Mailer had been killed by an African lion near the banks of the Zaire in his fifty-first year.